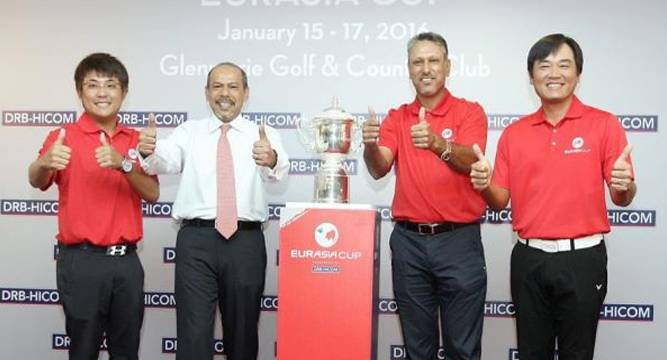 Hoping to be the backbone of the Jeev Milkha Singh-led Team Asia, the Malaysian duo of Danny Chia and Nicholas Fung say they want their captain to pair them up in the EurAsia Cup against Europe starting on Friday. The local heroes are expected to pull in big crowds to Glenmarie Golf and Country Club when Asia takes on a Darren Clarke-led Team Europe in the Ryder Cup-styled event which ended in thrilling draw two years ago. Chia and Fung, who attended a promotional photoshoot with the Petronas Twin Towers providing a stunning backdrop, believe they can be a tower of strength to the home team. Fung, who is one of Jeev’s captain’s picks, said: “I’m going to ask our captain to consider pairing me up with Danny in the fourball or foursomes session. Danny and I know each other’s game and he’s my mentor as well. Chia qualified for the team on merit after finishing eighth on the 2015 Asian Tour’s Order of Merit and is also hopeful to play alongside Fung, who featured in the inaugural edition in 2014. “I’m quite sure I will be paired with Nicholas on one of the days. But it is all up to Jeev because he is the captain. I will listen to what he says,” said the 43-year-old Chia. Fung, 25, is gunning to secure his first point for Team Asia after losing in all his three matches in the first edition of the EurAsia Cup, including a 1-hole defeat to Spanish veteran Miguel Angel Jimenez in the singles. “I’m happy to be back for the second edition. It is getting exciting. Hopefully we will beat Team Europe. I need to get points for Team Asia, that’s my goal,” said Fung.